As 'Beyond the Pale' resumes normal service following the 2007 Christmas break, and the Christmas puzzles, the BtP team would like to reflect briefly on a very interesting Procol year gone by. Jens and Roland, who run the website from Norway and the UK, met at the 1997 30th Birthday Celebrations, organised by Diane and John from Shine On. Our decision at that time to launch a new Procol Harum website reflected a lifetime's addiction to the band; but we never expected it to lead to a decade of real-world friendships with such excellent fellow-fans, and with so many of the band themselves. 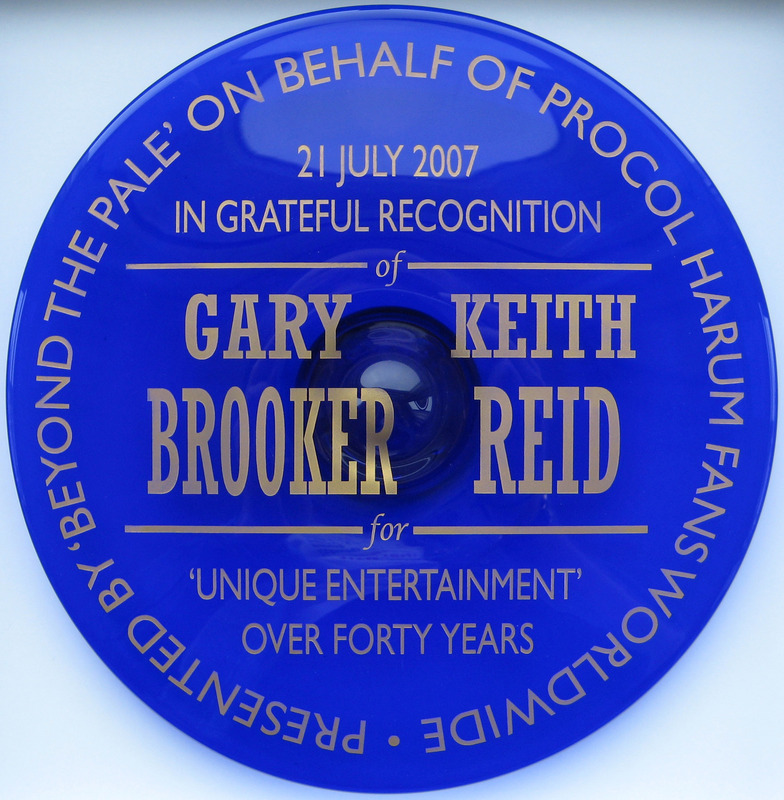 Our website was effectively ten years old on 19 July 2007 and the following day it was our great pleasure to introduce Procol Harum in a top central-London music venue for a sell-out show that we had booked and promoted ourselves. This fortieth anniversary celebration didn't attempt to copy the 'reunion' format of the groundbreaking thirtieth gathering, but it was as satisfying in its own way: and it showcased Procol's new, vibrant, line-up for the first time on home terrain. As well as thanking the band for fitting this celebration into their schedule and for playing a fine show in such extreme conditions, we would like to thank their manager, Chris Cooke, for his tremendous help – and our families for their kind forbearance. It was a great delight to see so many fans from overseas at this occasion, and at the 'Procol Rarum' evening that followed, when Gary and co (with Keith's amiable participation at the end) presented some excellent rarities from the Brooker / Reid catalogue. 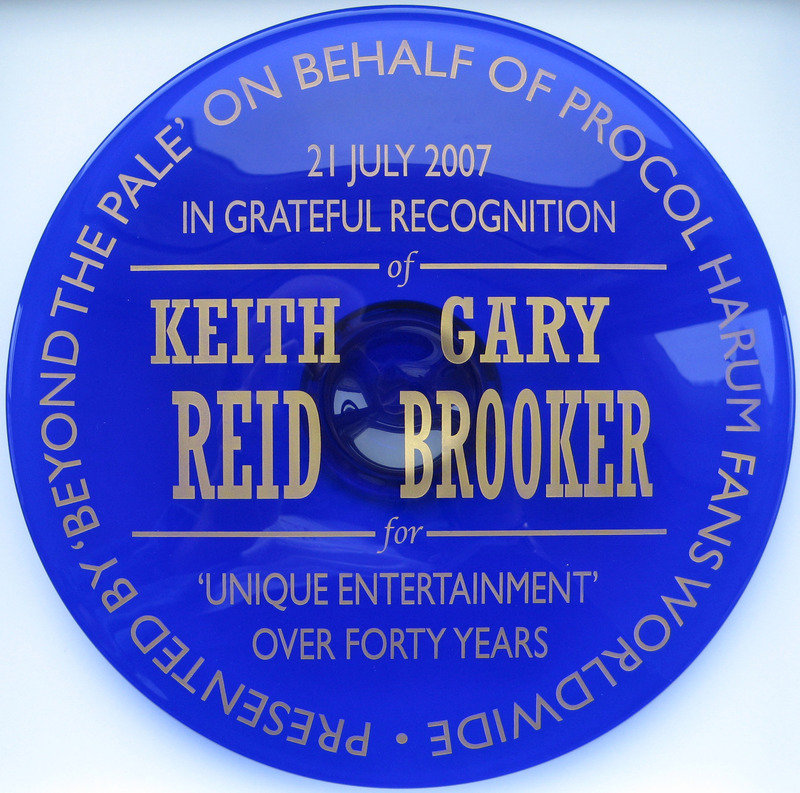 The illustrations on this page show the Bristol Blue glass plaques that were presented to Gary and Keith to mark forty years of their on-going collaboration which has, as we remarked from the stage, 'enriched the world'. One of the most unexpected features of these ten years has been all the opportunities for fans who are also players, who have really enjoyed getting together and playing Procol material, often with family members. This year we met in Southend and rehearsed in sweltering heat for four fantastic days; the results were heard at the 40th Anniversary Party at St John's Smith Square, and a subset of those players had the unforgettable privilege of opening for Gary Brooker and Friends in the evening. Hats off to Dave Ball and Geoff Whitehorn, whose hearty participation in our 'amateur' activities was both gracious and inspiring. Months of effort go into organising these international gatherings, during which time our bankers hold their breath; happily, fan support remains so strong that all efforts are repaid, and we have stayed out of the Debtors' Prison. We have also had a lot of great feedback following the opening of the much-improved Procol Online Store, from which tee-shirts, recordings, and great reading-matter speed out to Procol fans all over the world. Thanks to everyone! As well as George Lovell's Procol Book and the Palers' Project recordings, we've had the pleasure of selling Procol Harum's excellent new anthology Secrets of the Hive, with liner-notes (and title) by Roland from BtP – on a not-for-profit basis. This has been their first-ever career-wide retrospective and Salvo, their record label, paid impressive attention to detail; the remastering has brought out musical details one never heard before. Salvo also produced AWSoP as a vinyl 45 rpm record and a CD EP, and these have proved very popular too. We have high hopes for their ongoing re-release series. Meanwhile, Procol themselves have continued to play live in various countries: strong new material has been aired and some very desirable songs (like The Milk of Human Kindness) have come out of the Harum vaults. The new line-up has been stormingly received in Germany, the UK, Italy and the Netherlands this year, and with orchestra and choir in a most spectacular setting in Sweden. Many friends have met, and been made, at all these concerts; new tee-shirt designs have been snapped up. No new material has yet been recorded, and we also live in hope of seeing the official orchestral recordings made in Denmark in 2006: so far only the live A Whiter Shade of Pale has seen the official light of day, thanks to iTunes. In addition, Gary Brooker's other band, No Stiletto Shoes, played three UK gigs just before Christmas, sounding better than ever and raising a worthy sum for charity. Their live CD is still available and, characteristically, some of the proceeds go to another charity too. When a group of fans had a Christmas lunch with the Brookers and some of the band we were able to represent to 'The Commander' how much his music means worldwide, and to express a fervent hope that Procol will tour again in 2008. We know how much it would mean to our Fellow Travellers if the band could cross the Atlantic too. At present, however, the Procol slate is blank for 2008, and we keep our fingers crossed for favourable omens before long. As always, fans who have subscribed to our (very) occasional 'Fresh Fruit' newsletter will be the first to know the moment we learn anything new: meanwhile The Beanstalk continues as a respected and genial international forum reflecting all shades of opinion about this remarkable band. So we conclude with good wishes to all, and hearty thanks to Gary Brooker, Keith Reid, Geoff Whitehorn, Matt Pegg, Josh Phillips and Geoff Dunn for the great and promising music of the last twelve months.